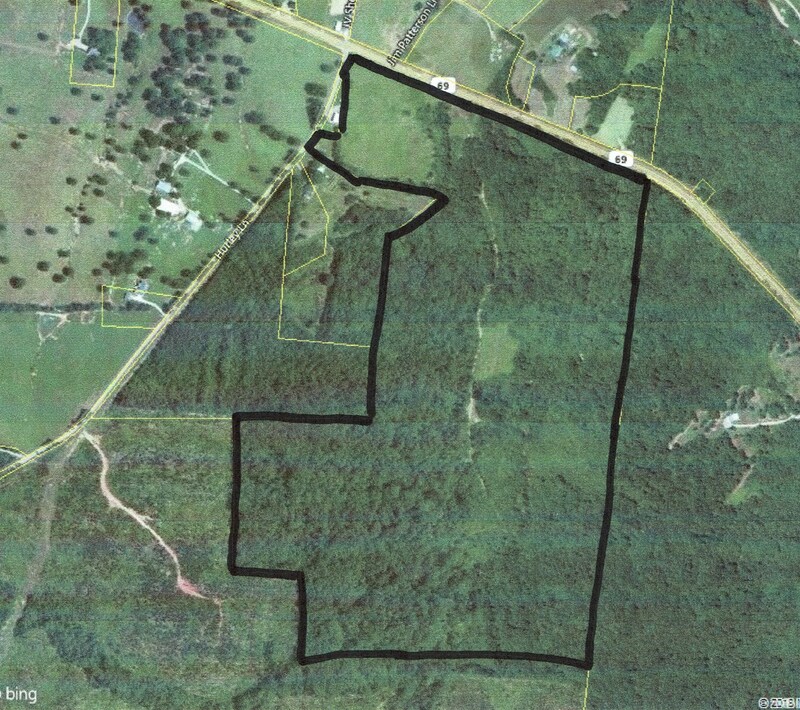 HWY 69 / HURLEY RD - Wooded Land in Tennessee for sale w/ Creek / Stream, open fields, hunting, great building sites and will make a great cattle farm / ranch. 109 Acres of Great Recreational land offering Whitetail Deer Hunting, Turkey Hunting, Small game Hunting, Hiking, ATV Trails / Horse Riding Trails, Timber, etc. Beautiful Building spots. If you are searching for an above average piece of land to call your own, this could be it. There is about 9 ac’s on the norths side of the property that borders Hwy 69 and Hurley Rd that is open and is an absolutely gorgeous building site. Huge Oak Trees stand around the old home and home site. There is an old well on the property at the home site. Utilities are available at the road. The balance of the land is wooded w/ tall native Tennessee hard and soft wood trees. The land is gentle rolling and there are trails all through the property. Trails are perfect for riding horses, ATV’s, dirt bikes, mountain bikes and hiking. The hunting on this tract is above average. Plenty of Deer, Turkey and small game. The creek / Stream runs year round and completely through the property. Based on my measurements, (estimated) it runs for over 3000 ft through the pristine property. It’s a big plus and rarer, that the creek runs through the property rather than border it which is most common. In other words, you will own the land on both sides of the creek. Notice in the photos the beautiful “rock outcroppings” along the creek. Let me know and I can send you more video of the creek and outcroppings. Property is located only 7 miles from beautiful Savannah TN in Hardin County (hospital and shopping) and 5 miles from Pickwick Lake, the Tennessee River and Bruton Branch State Park. Great community, low property tax’s, friendly people. Thank you for visiting our United Country River City Realty website. Robert is not from Savannah, TN; he lives here because he absolutely loves it and wants to be here. He has lived in the Hardin County area for 30 years. Spent 15 years in the food business as a manager, worked up to Director Of Operations of a large food company and finally owning and operating his own restaurant. Form an early age he has always had an interest in the Real Estate business. Robert says: “When the opportunity presented itself, I jumped! Best business decision I have ever made, I love it”. With 20 years in the real estate business, he has negotiated hundreds of real estate transactions for both buyers and sellers. He has also learned very early in life that it’s better to listen more and talk less. The homes, land, and recreational market can be pretty complex even in small towns like Savannah, Adamsville, Pickwick, and Counce. It is forever changing but, Robert and his TEAM continually study and take advantage of educational opportunities to stay on top of the changes and market conditions locally and throughout West Tennessee. When not working in the business, he enjoys gardening, hunting in Olivehill, fishing at Pickwick Lake and the Tennessee River, and riding his motorcycle across the country. He participates in community service and is always involved in making this area an even better place to live and raise a family. Robert has been married 40+ years to Sandi, his high school sweetheart and business partner. He has two married children and 2 wonderful precious grand girls that he adores. Robert understands the value of friendships, enjoys making new ones and putting smiles on every face he meets. Robert Hicks commits to provide personal, professional, ethical and "over the top" service to each and every client, and to make all transactions as easy and as stress free as possible.